In Hear This, The A.V. Club writers sing the praises of songs they know well. This week: We’re kicking off the season with holiday songs we’re not sick of yet. Debuting in Experiment 321, “Santa Claus Conquers The Martians,” Crow’s opus focuses exclusively on the Road House portion of Swayze’s storied career, skipping over Ghost and Point Break to deliver the first kneecap-smashing action sequence ever included in a holiday carol. Meanwhile, the lyrics get more and more ridiculous, with the narrator promising to make Santa Claus “our regular Saturday night thing,” and destroy anyone who dares to touch his car. For all its bloody violence, decorated barstools, and pure, unadulterated silliness, though, “A Patrick Swayze Christmas” still manages to evoke the warmth of Christmas in a way that so many more-commercial, less-Swayze-based carols can. 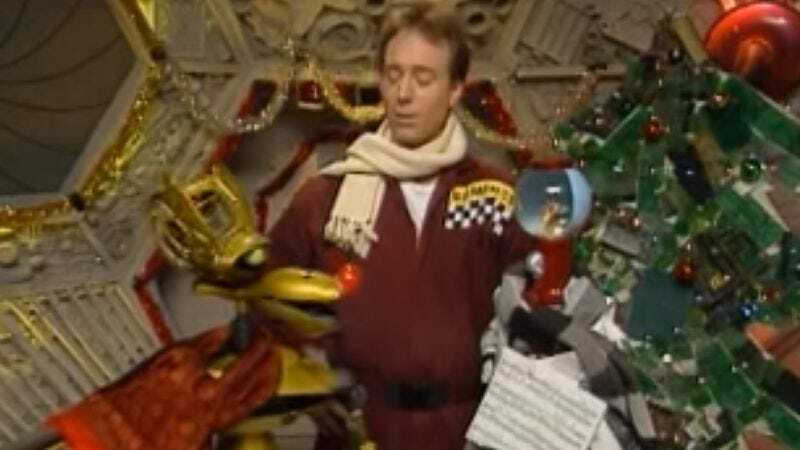 None of the performers—Trace Beaulieu as Crow, Joel Hodgson as Joel, or Kevin Murphy as a snow-globe-sporting Tom Servo—are the world’s greatest singers, but their awkward, off-key gameness is part of the pleasure of the song. If “Patrick Swayze Christmas” was a professional affair—as in the more acoustically pleasing but less charming version put together a few years ago by a capella group The Lost Keys—it wouldn’t be MST3K, a show that was first and foremost about hanging out with the people that you love—especially for those in the audience who’ve come to see Joel, Mike, Tom, Gypsy, and Crow as a kind of surrogate family. Sure, Joel and Servo razz Crow throughout the song, mocking his enthusiasm, his choice of subject matter, and his love of gleefully described, throat-tearing violence. But they still sing along, and when the trio promises that this could be “the haziest,” “the laziest,” “the Swazy-est Christmas of them all,” it’s hard not to believe that this year, they might just be telling the truth.